Two weeks ago I go a delivery from a shop modernHome.pl, that contained two new 30 W solar panels. This weekend I finally had some free time to make some tests and prepare some photos to show here. At this moment my solar system has 150 Wp and consists of 5 solar panels. I have one 10 Wp flexible solar panel, two 40 Wp laminated glass panels and those two Wp monocrystal panels. 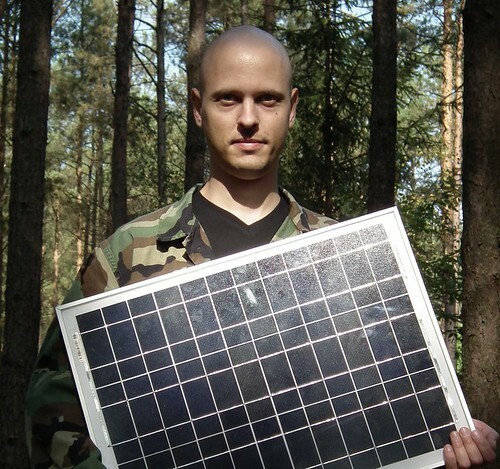 Me and one of my two new solar panels. 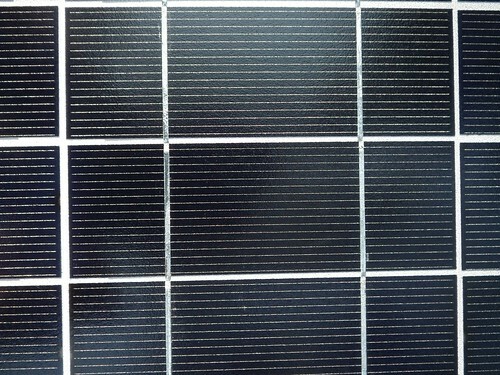 The solar panels are made of 36 monocrystal solar cells connected in series. In standard conditions (1,000 W/m², AM 1.5, 25°C) they give 30 W output each. Since I don’t have a wattmeter that would be able to measure the power of such device (I own a wattmeter that’s plugged into wall socket and measures the amount of energy used by household devices, but that won’t work here), so the only thing I could measure is the open circuit voltage (Voc). As I spend this weekend at my parents’ summer cottage in a pine forest, I had some trouble to find a spot with clear sunlight, and I almost managed to succeed. 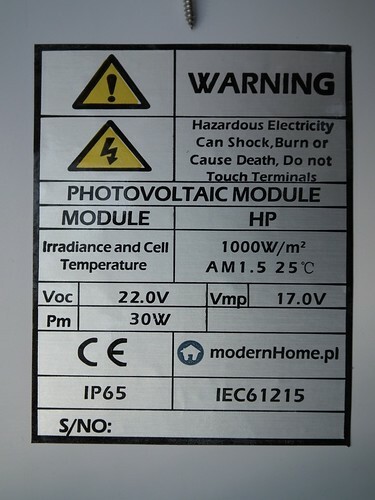 I set up the solar panel so that the solar rays would be perpendicular to the panel’s surface (the easiest way to do so is to check at which angle the shadow cast by the panel is the longest) and managed to measure voltage Voc = 21,8 V. I believe the voltage shown on the sticker at the back of the panel (Voc = 22 V) is real as well. 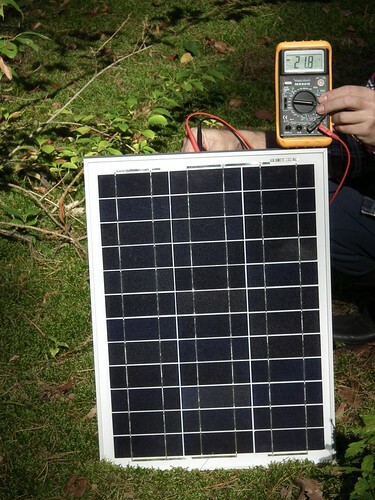 Measuring Voc of the tested solar panel. Sticker on the back of the solar panel. Vmp is the voltage at the poinf of maximum power generated. This value is typical for the 12 V solar panels. IP65 is the ingress protection rating. According to the IEC 60529 international standard it means the panel is dust tight, and also is protected against water jets. The connection box on the back of the panel would not be exposed to rain or snow, as it would be facing down, but when the panel is installed on the roof it might be exposed to moisture. 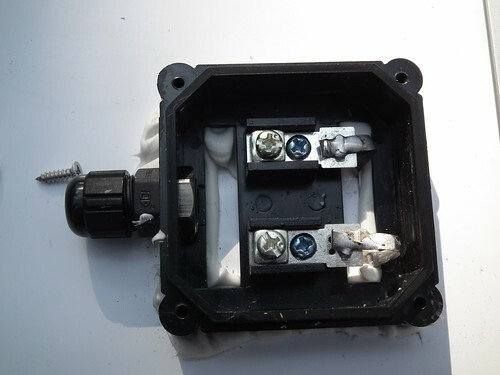 The photo above shows the connection box of the solar panel. As you can see, the wires are connected to the panel using a bolt, which is quite convenient. There’s no indication which terminal is positive and which is negative. I am sure that someone who is going to connect those solar panels would be able to determine that for himself, though. In comparison to my previous solar panels (to which I had to solder the wires) it’s much easier to use. The box is closed with a rubber seal and a cable gland to make it tight. The solar cells are covered with hardened glass that should protect the cells from hail. The case is made of aluminum profiles and laminate. The profiles have a couple of holes to make it easier to mount the panels. You can purchase such solar panel at modernHome.pl, for PLN 269 or € 60.63 (roughly $ 80.2), which makes it cheaper than PLN 8 (€2 / $3) 1 Wp. It seems they have english version of the site and are able to ship in Europe.